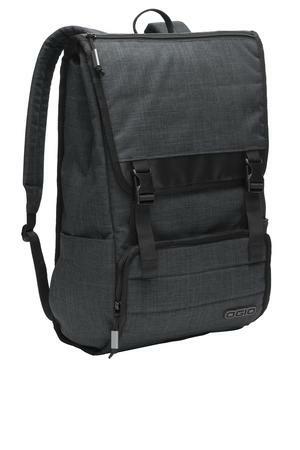 The OGIO Apex Rucksack Style 411090 is available in sizes OSFA and may be purchased in your choice of the following colors: Heather Grey. This rucksack keeps your laptop and other tech gear well-protected while the two-tone crosshatch pattern adds modern street-cred. Front accessory pocket with mesh pocketsSide beverage pocketSide accessory pocketLaptop sleeve: 15.5 h x 10.5 w x 1 d; fits most 17 laptopsDimensions: 18.5 h x 12.25 w x 6.5 dCapacity: 1 300 cu.